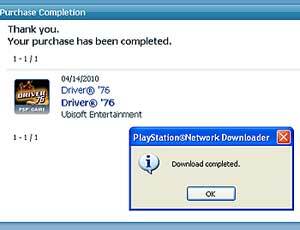 So this morning, I thought, "what the heck" and bought Driver 76 off the PlayStation Store. For $9.99 (plus PST + GST) it was worth it. I think of my PSPgo as a "Greatest Hits" kind of PSP; that I'd load it only with my most favourite PSP games... but then there's the other side of me that's only interested in getting good CHEAP & AFFORDABLE games off the PS Store. The prices have come down on some of them, though they're still more expensive than what can be found at retail. Like the recent permanent price drop of Jak & Daxter on the PS Store-- from $30.00 to $20.00... not bad. but The Source has it clearance priced at $14.96 right now. Even the really impressive price drop of Loco Roco 2 to $7.99.. a few days ago I bought it for $0.96 at The Source.... yes, 96 cents. Sure I already have the game but that's practically free. May as well buy one to give away or whatever.... but again, these are clearance prices and aren't typical. I'd be lucky to find any stock. I have to admit, Driver 76 is pretty fun. It didn't get very good reviews, and it's not a mind-blowing game, but I think it looks pretty good. The cutscenes are done in a 1970's comic book style, with the Ben-Day dots colouring, it's a very fun & cheesy presentation-- the whole game is basically a '70;s exploitation film or something, and the music is great if you like '70's rock.... I just played a mission with Bowie's Suffragette City playing in the background... that's friggin' awesome. I don't really get the complaints about lack of other cars or people, I find there's quite a bit of both-- you can keep running over people one after another for a few blocks-- and it's not too crowded so you can cut loose & gun the engine for some straight stretches. There are some problems. The audio is clipped and too compressed; there's stuttering for some of the music. The notoriously long load times are still here in the digital version... there's 2 kinds of loading screens... and sometimes the game will completely freeze for about 5 seconds while the loading disc icon flashes. Sheesh. The loading process could've been more streamlined. And the game seems short, the main missions can be completed very quickly. There are a lot of side missions though. So far it's an overall enjoyable game & worth the sale price.